1Information Services Division, NHS National Services Scotland. 2Macmillan Cancer Support. While many cancers survival rates are improving over time, a deprivation gap still exists. Overall, the age-standardised incidence rate of cancer is higher in those living in deprived communities than those living in the least deprived areas (758 per 100,000 compared with 595 per 100,000). Of all cancers diagnosed in the five year period 2011-2015, 21% were in the most deprived quintile, so slightly higher than might be expected. However, for the same period, the proportion of deaths for the most deprived quintile was 23%. This suggests people living in deprived communities are dying from cancer at a higher rate. 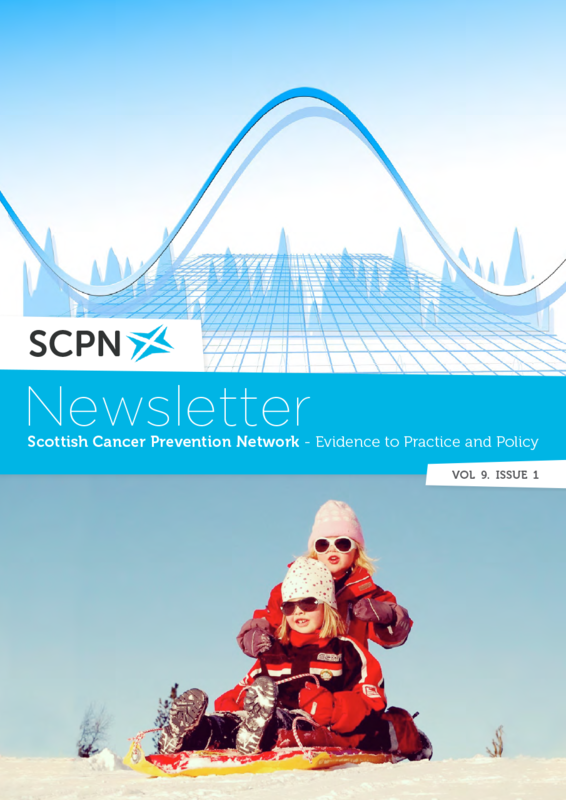 In February 2017 Macmillan and ISD published an age-standardised net survival analysis by deprivation quintile for the twenty most common cancers in Scotland and for seven of the most common cancers there appeared to be a difference in survival. These were: breast, colorectal, head & neck, liver, lung, prostate and thyroid cancer. 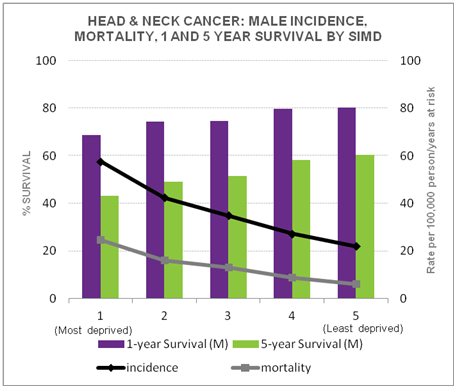 Taking head & neck cancer in men as an example, the figure shown here demonstrates the trends in the relationship between survival, incidence, mortality and deprivation. Incidence and mortality increase with levels of deprivation while survival shows an inverse relationship. 69% of men from the most deprived group were estimated to be alive one year after diagnosis compared with 80% in the least deprived group (a difference of 11%). At five years this difference in net survival increases to 17% (43% in the most deprived compared to 60% in the least deprived group). For each cancer investigated a baseline model was fitted to look at excess risk of death in the deprived compared to the least deprived group. For head & neck cancer this model suggested an excess risk of death in the most deprived group 61% higher than in the least deprived (CI: 1.34-1.88). 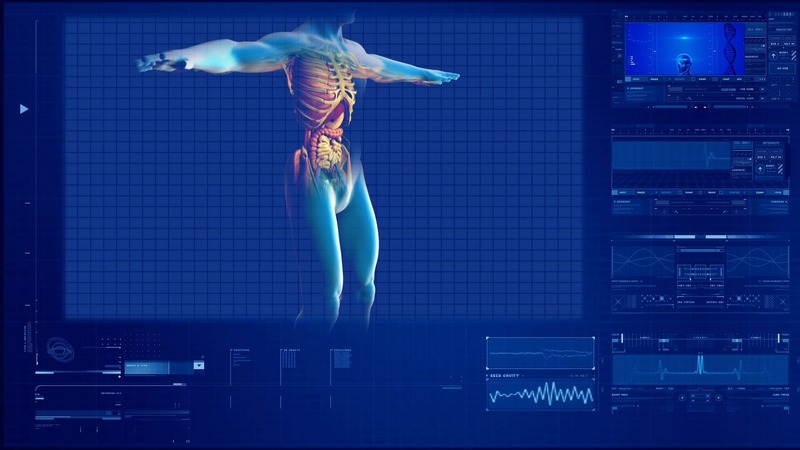 To explore why a higher risk of death is observed further modelling took place including patient characteristics, tumour, health service and treatment factors. For some cancers (lung and liver) the survival gap was explained by the factors investigated (so the effects of deprivation were most prominent in the modelled factors) whereas for others (breast, head & neck, colorectal and prostate cancers) the deprivation gap was only partially explained by the included factors and further work is warranted to understand the unexplained variation. Through partnership working, ISD and Macmillan are seeking to deliver insights in to Scottish cancer data to support improved models of care, and identify gaps and opportunities to deliver world class data collection and analysis and improve outcomes for people living with cancer. Further information on the collaboration and this deprivation work can be found on the Macmillan website. Our publication uses data shared by patients and collected by the NHS as part of their care and support.